This app landing page template has all the prerequisites you need to convince your newly acquired customers to get interested in your mobile app or product. Includes testimonials, pricing, a section for a main video and more! With an pre-launch app landing page, you can spread the word about your app even before the launch. Get this template to boost marketing efforts after the app is on the market. 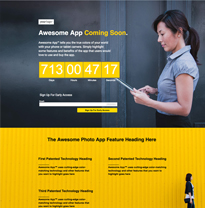 This App Landing Page Template is simple, sleek and intriguing. 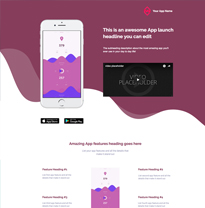 Use our responsive mobile app landing page template to showcase your latest app in creative and unexpected ways with modern design. 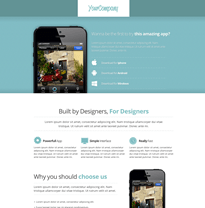 This awesome responsive pre-launch App Landing Page template for your upcoming new apps. It has a number of configurable sections to highlight the qualities and features of your app. 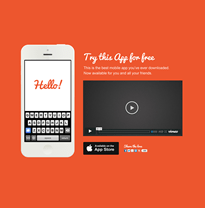 LanderApp helps you to showcase your latest app in creative and unexpected ways. This App Landing Page Template showcase your app's features, provide links to your main website and social media accounts.